Due to the CAN protocol, the maximum length of a CAN bus depends on the bit rate. Therefore, a bus cannot be extended with the PCAN-Repeater DR. 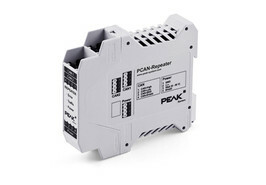 The physical total length of the CAN bus is reduced with each built-in PCAN-Repeater DR according to its signal delay.